Do you want to know how to stop a bloody nose? These are some of the quickest and easiest ways to stop the bleeding. What should you do if you have frequent nosebleeds? Have you ever had one of those embarrassing nose bleeds at one of the most inconvenient times? Like that time when your child has had a nose bleed in the middle of the store or of course when company is over. No matter when it happens, a nose bleed is no fun. People used to think just tipping your head back would stop a nose bleed, but other remedies have come around that prove to be more effective. Here are some ways on How to Stop a Bloody Nose in it’s tracks! There are different kinds of nosebleeds. The anterior nosebleed and the posterior nosebleed, depending on where the nosebleed is coming from. Anterior means front which is more in the front of the nasal cavity and posterior means back, which means the bleeding comes from the back of the nasal cavity. Blood flow is usually much heavier in anterior nosebleeds. Sit up Straight: Recent studies thought that lying down would stop a nose bleed, but in all reality, it just makes it worse by running down the back of your throat. Tilt your Head Forward: Instead of backward, you should tip your head slightly forward. Swallowing blood can irritate your stomach and cause vomiting that will make your nose bleed worse. Pinch Your Nose: You want to apply pressure to any wound, and that includes your nose. Using your forefinger and thumb, pinch the soft part of your nose closed (both nostrils). Remember to breathe through your mouth as you pinch your nose closed for about 10 minutes. If it’s a lot of blood, this way might not work, just because it might stay too wet to properly clot. Use an Ice Pack: Once you have pinched your nose, apply an ice pack or anything cold from your freezer. Cold restricts your blood vessels and helps them to clot faster. Check Your Nose: After 10 minutes of ice and pressure, check to see if your nose is still bleeding by gradually releasing the pressure and un-pinching your fingers. If your nose is still bleeding, continue pressure and ice for another 10 minutes. If not, take steps to prevent another nose bleed. Moisten Your Nose: Once your nosebleed has stopped, it’s important to put a thin layer of saline or nose gel into your nostrils. You can use a nasal spray for this. This will help soften the membranes inside your nose and help prevent further nose bleeds. Do not blow your nose for the next 12 hours. It is important to take care of a nosebleed fast, yet effectively to prevent further nose bleeds. What other tips have worked for you at stopping a nose bleed? Remember that nasal decongestants are often times designed to dry out your nose, which means that they can contribute to nosebleeds. You want to skip them if at all possible. I find that if your nose is going to bleed again, it’s probably going to be within 30 minutes. So, try and sit still for at least that long to help with the blood clotting. Nose bleeds can be tricky that way. If your nose is bleeding for longer than 30 minutes or so though, we suggest you seek medical advice, because nose bleeds can be a sign of high blood pressure. One of the things about nose bleeds is that not only do you want to stop them fast, but there are things you can do to actually prevent nosebleeds that are easy and don’t take up a lot of time. Why does my nose bleed? Most of the time it’s because it’s too dry inside your nostrils. 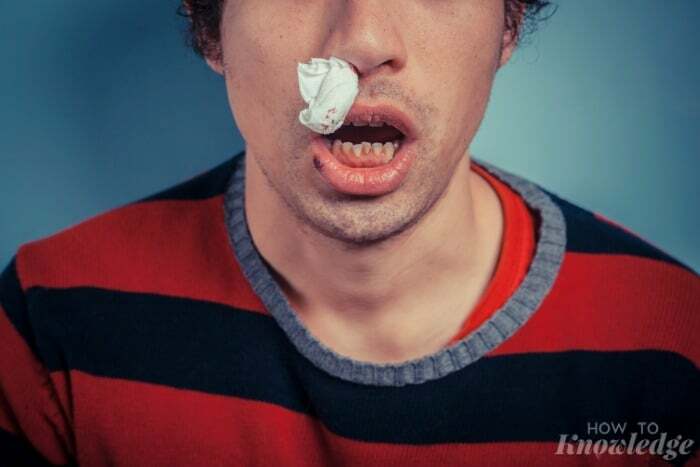 One of the things you can do to prevent a bloody nose is to put a little petroleum jelly or antibiotic ointment on a cotton swab and run it around just inside your nostrils. You don’t need to go super high up where it feels like it’s in your brain or anything, you just need to get in there to protect the sensitive skin of your nasal membranes. You just want to keep your nose moist. When the skin breaks, often times that is what will cause your nose to bleed.